Best Father’s Day BBQ recipe EVER – seriously you have to try this! If you are celebrating in your community this Father’s Day weekend surrounded by family and friends around the barbecue, you’ve got to try this awesome BBQ recipe. Its quick and easy, and very tasty. Thanks to our friends at Epicurious and the Bon Appetit test kitchen, this one is a real winner! Why stick with chicken or eggplant? Portobello Parmesan is just as tasty—and it doesn’t need any breading. Choose mushrooms that are fresh (you’ll know because they’ll still be curled up around the edges). Older ones are flat and won’t hold the filling as well. Prepare barbecue (medium-high heat). Whisk extra-virgin olive oil, balsamic vinegar, and pressed garlic clove in small bowl. Season dressing to taste with salt and pepper. Arrange portobello mushrooms on rimmed baking sheet, gill side up. Sprinkle with salt and pepper. Spoon generous tablespoon dressing into each mushroom; swirl to coat. Stir ricotta cheese, 1/2 cup Parmesan cheese, and 2 tablespoons chopped fresh basil in small bowl to blend. Season to taste with salt and pepper. 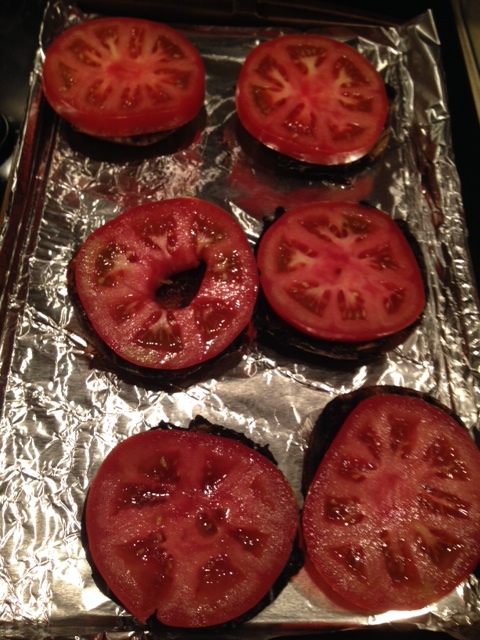 Arrange tomato slices on plate; sprinkle with salt and pepper. Place mushrooms on grill, gill side down. Grill until edges begin to soften, 3 to 5 minutes, depending on thickness of mushrooms. Transfer mushrooms to same baking sheet, gill side up. Nestle 1 tomato slice into each mushroom. Divide ricotta cheese mixture atop sliced tomatoes, spreading to cover, about 3 tablespoons per mushroom. Top with Fontina cheese slices, dividing equally. Sprinkle 1 tablespoon Parmesan cheese over each. Carefully return mushrooms to grill. 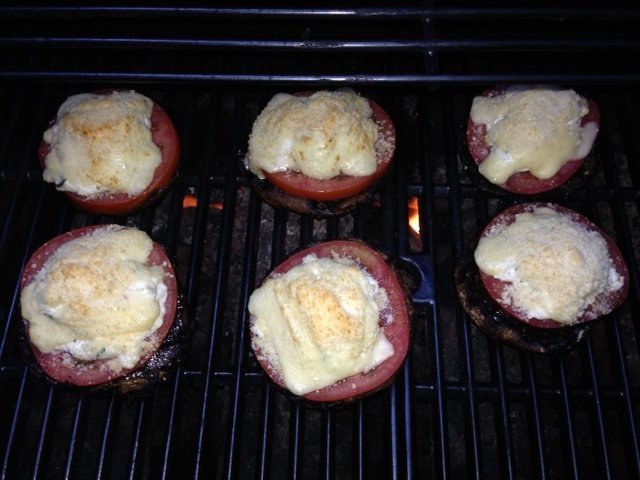 Cover barbecue and cook until mushrooms are soft and cheese is melted, about 5 minutes. Sprinkle remaining chopped fresh basil over. Place mushrooms on plates. Drizzle remaining dressing around mushrooms and serve. 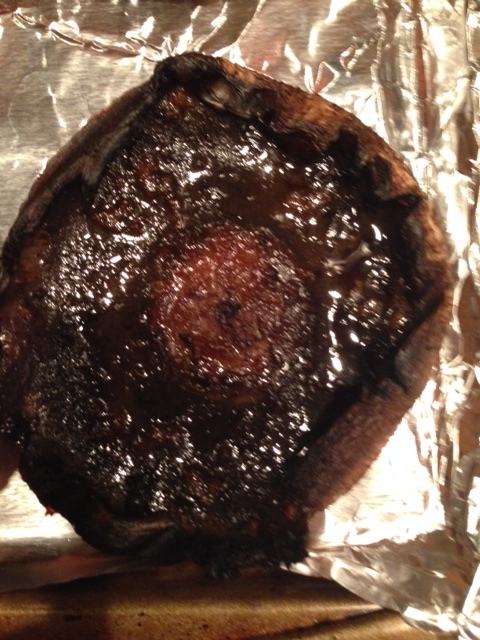 This entry was posted in Uncategorized and tagged #FathersDay2014, #leader, BBQ, Bon Appetit, community, Dad, delicious, Epicurious, family, Fathers Day 2014, June 15, Portobello Mushroom, Vince Liuzzi. Bookmark the permalink.